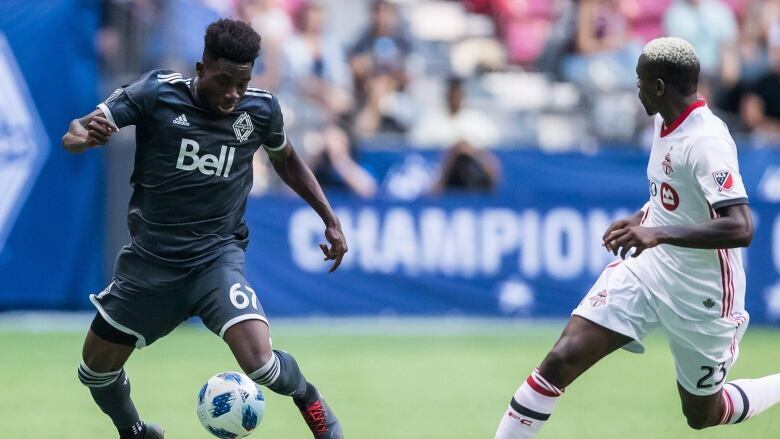 An MLS-record transfer to German powerhouse Bayern Munich hasn't changed Whitecaps teenage star Alphonso Davies, according to Vancouver coach Carl Robinson. "He's exactly the same and people who know him will tell you his feet are on the ground," Robinson said after training Tuesday at BMO Field. "Once you get to know him, you know what a character he is. He loves his PlayStation or his 'Fortnite' whatever they play, his dancing. That's why he gets on with all the boys in the locker room. "But his feet have remained firmly on the ground. And if they weren't, I'd bring him back down to earth. Because he's going to have to get used to that when he leaves us at the end of the year. But while he's here I'll make sure he conducts himself properly and he's a proper teammate ... Individuals don't win anything, teams win things. And that's the dynamic that I have at this football club." The Whitecaps (9-9-6) are in town for Wednesday's second leg of the Canadian Championship final against Toronto (6-12-5). The two teams tied 2-2 in the first leg last week at B.C. Place Stadium. Davies, who turns 18 on Nov. 2, is headed to Bayern Munich after this season in a record-breaking transfer agreement for Major League Soccer. The move involves a fixed transfer fee and additional compensation that could total more than $22 million US, the most ever received by an MLS club in the league's 23-year history. The attacking midfielder will be eligible to play for Bayern when the international transfer window reopens in January 2019. Davies missed Vancouver's 2-1 league win in Portland on the weekend with a right hip flexor strain and left training early Tuesday. Asked how Davies looked in his practice back, Robinson said "Not great to be honest." "I feel good," he told reporters. The teen also said he felt no pressure in the wake of the transfer. "I just want to go out there and have fun," he said.